you can’t seem to have enough of those tasty treats! Or suddenly at midnight, you develop a sudden fondness of a fully loaded pizza. And now that you are pregnant you crave chocolate when usually you are not even a sweet person! Specific food cravings are very much a symptom of pregnancy; perhaps as much as morning sickness and all the other symptoms. 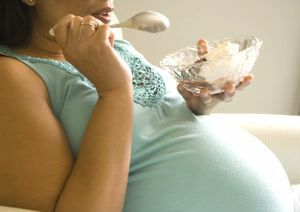 It is thought that pregnant women crave certain foods because they are required by the body to nourish the unborn child. For instance, some foods with particular nutritional content may be what a woman craves for: for instance a vegetarian woman may be horrified to be craving meat; which would probably be the extra requirement for protein that a pregnant body has. Equally some women develop food aversions during pregnancy which they did not otherwise have. For instance a woman may otherwise enjoy eating cottage cheese but cannot stand the sight of it during her pregnant state. Or the smell of boiling milk may send another strait to the loo to throw up! If you indulge a craving for fried and fatty food (it often happens simply because your body needs at least some extra calories at this time), you may well end up eating far more calories than you need. Also they may be the wrong kind of calories, with little or no nutritional benefits. You may want to eat that entire sinful chocolate cake or the jumbo bag of bacon flavor chips but it is certainly not good for you! Giving into such craving will pile on the weight that you may find extremely difficult to dislodge after your baby is born. Spicy food craving is also common for pregnant women. The reason you should control it is that it may cause acidity or exacerbate acid reflux or similar conditions. If you develop a certain aversion to some foods which you should be having more of during this time, then perhaps you could substitute them with something of equivalent nutritional value. So you cannot stand to have that extra glass of milk, perhaps you can compensate by having an extra helping of yoghurt. Keeping these few pointers in mind, there is no reason why you should not otherwise indulge your cravings to the hilt!